As I was wrapping up the gifts for one of the February birthday girls, I thought you might like to see what I'm giving. I found the neatest kit at HM Ben Franklin Crafts for a Herbarium. "What's that? ", you ask. I think the name is a made up one, but the kit makes an awesome floral arrangement in liquid that is encased in a jar. All the parts are included in the kit...so fabulous. 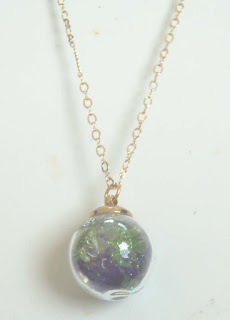 Ironically, I was planning to make this glass globe pendant (that was demonstrated at HM BFC recently). Doesn't it match well with the Herbarium? 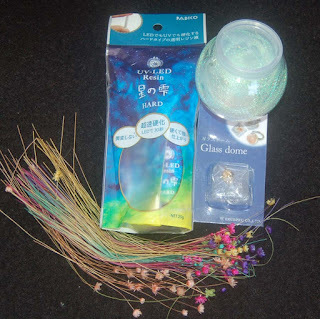 It was easily made using the glass globe kit, straw flowers, sparkling threads, and LED/UV liquid resin. I think the pendants demonstrated were filled with a liquid (like the substance used in the Herbarium) but I chose to fill mine with resin so that when it is hardened in light, there is no risk of leakage. I really love the sparkling threads because they add just the right amount of mystery to the globe. I hope you'll consider giving some lucky person a birthday (or Valentine's) gift of something to craft and something you craft for her. Enjoy shopping at the locally owned HM Ben Franklin Crafts! P.S. 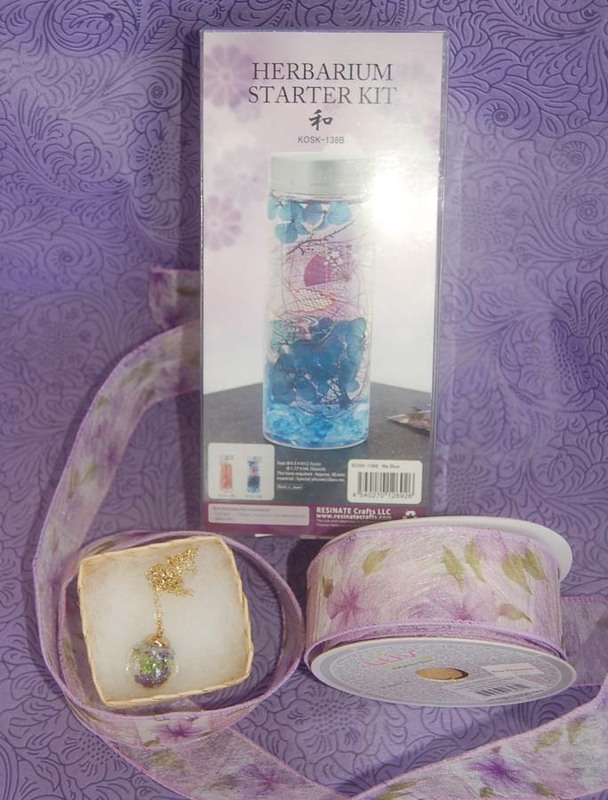 The pretty lavender wrapping paper is from Celebrations and comes on a giant 10 meter x 750mm roll. The paper is nice and thick with a velvety embossed surface. The floral ribbon was purchased at HM BFC.